—Feb. 11, 2011: Autocrat Hosni Mubarak steps down after 18-days of nationwide protests against his nearly 30 years of rule. The military takes over, dissolving parliament and suspending the constitution after the uprising, which left hundreds of protesters dead. — Nov. 28, 2011_Feb 15, 2012: The Muslim Brotherhood wins nearly half the seats in multi-stage elections for the first post-Mubarak parliament, while ultraconservative Salafis take another quarter. The remainder go to liberal, independent and secular politicians. — June 14: The Supreme Constitutional Court orders parliament dissolved on grounds the election rules were unconstitutional. — June 17: Mohammed Morsi defeats Ahmed Shafiq, the last prime minister under Mubarak, with 51.7 percent of the vote in a runoff presidential election, taking office on June 30. — Nov. 19: Members of liberal parties and representatives of Egypt's churches withdraw from the assembly writing the constitution in protest over dominance of Islamists. — Nov. 22: Morsi unilaterally decrees greater powers for himself, giving his decisions immunity from judicial review and barring the courts from dissolving the constituent assembly. The move sparks days of protests. Islamists hurriedly finalize a draft constitution and Morsi sets a Dec. 15 date for a referendum. — Dec. 4: More than 100,000 protesters march on the presidential palace, demanding cancellation of the referendum. The next day, Islamists attack an anti-Morsi sit-in, sparking street battles that leave at least 10 dead. 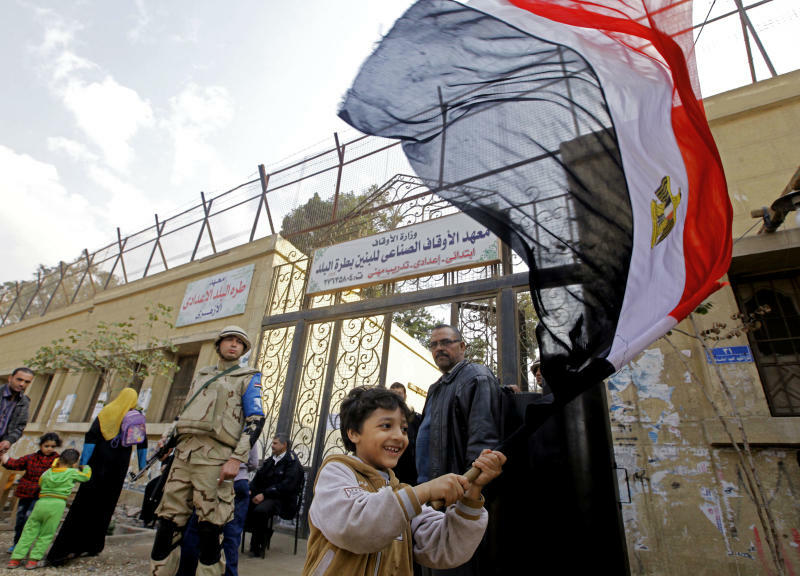 — Dec. 15, Dec. 22: Egyptians approve the constitution by referendum, with 63.8 percent voting in favor but turnout low. — Jan. 25, 2013: Hundreds of thousands protest against Morsi on the second anniversary of the start of the anti-Mubarak revolt; dozens die in ensuing clashes. — April 7: A Muslim mob attacks the main cathedral of the Coptic Orthodox Church during a funeral for four Christians killed the day before. Pope Tawadros II blames Morsi for failing to protect the building. — June 30: On Morsi's anniversary in office, millions of Egyptians begin days of massive demonstrations demanding he step down. The military gives him 48 hours to reach an agreement with his opponents, but he vows to stay in power. — July 3: Egypt's military chief Gen. Abdel-Fattah el-Sissi announces Morsi's removal, installing Constitutional Court Chief Justice Adly Mansour as interim president. Tens of thousands of Morsi supporters camp out in two sit-ins in Cairo's streets demanding his return. — July 8: Egyptian soldiers fire on Morsi supporters protesting outside a military facility in Cairo, killing over 50. Each side blames the other for starting the violence. Mansour sets a timeline for amending the constitution and electing a new president and parliament by mid-February. The Brotherhood refuses to participate in the process. — Aug. 14: More than 600 people, mostly Morsi supporters, are killed when riot police clear the two pro-Morsi sit-ins in Cairo. The presidency declares a monthlong state of emergency, with a curfew in Cairo and other cities, later extended by two months. Islamists retaliate by torching government buildings, churches and police stations. — Aug. 18: A government tally says the nearly 900 people have been killed in four days of unrest, though rights groups put the number higher. Authorities intensify arrests of Brotherhood leaders and members. Two days later, the Brotherhood's top leader, Mohammed Badie, is arrested. — Aug. 19: Suspected Islamic militants kill 25 policemen in the Sinai Peninsula. Militant attacks escalate in Sinai over the following months, with shootings, bombings and suicide attacks against security officials and troops. — Sept. 5: Egypt's interior minister survives a suicide bombing in Cairo. — Sept. 23: An Egyptian court orders the Brotherhood banned and its assets confiscated. — Oct. 6: At least 51 people killed when security forces and Islamist protesters clash during a national holiday. — Oct. 9: The U.S. suspends delivery of tanks, helicopters and fighter jets to Egypt's military in a show of disapproval over the anti-Brotherhood crackdown. __ Nov. 4: Morsi is flown by helicopter from his secret detention place to trial at a police academy in eastern Cairo, where proceedings are adjourned until Jan. 8. __Dec. 24: A car bomb rips through a security headquarters in the Nile Delta city of Mansoura, killing 16 people, almost all policemen in the deadliest attack since Morsi's ouster. The militant group Ansar Beit al-Maqdis claimed responsibility for the attack. __Dec. 25: The government designates the Brotherhood a terrorist organization, the latest measure in the crackdown against the group. __Jan 14: Egyptians start voting on amendments to the constitution adopted under Morsi in 2012. The referendum is considered a key step in the roadmap put in place after July's coup that bestows legitimacy on the interim regime and paves the way for a likely presidential run by military chief Abdel-Fattah el-Sissi.